UN Special Envoy on Syria Staffan de Mistura said that he decided to bring pause to the intra-Syrian talks and the next stage of negotiations will take place on 25 of February. GENEVA (Sputnik) — The intra-Syrian talks on crisis settlement have been postponed until February 25, UN Special Envoy on Syria Staffan de Mistura told reporters on Wednesday after a meeting with Syria opposition’s High Negotiations Committee envoys in Geneva. "I concluded that after the first week of talks, there is more work to be done…I am not prepared for talks for the sake of talks," de Mistura said. "I decided to bring a temporary pause to the talks. The next stage will take place on 25 of February," he announced. "At this stage it is very important to give the opportunity to those who have been insisting that the talks should take place that they also address the issues that are pending and unresolved," de Mistura said. "Therefore I will be asking for the International Group for Syria Support to convene as soon as possible, hopefully already in Munich, and the Security Council to meet, and we reconvene in Geneva again on February 25th," he stressed. Staffan de Mistura said also that he will attend a meeting of international donors on Syria in London on February 4. 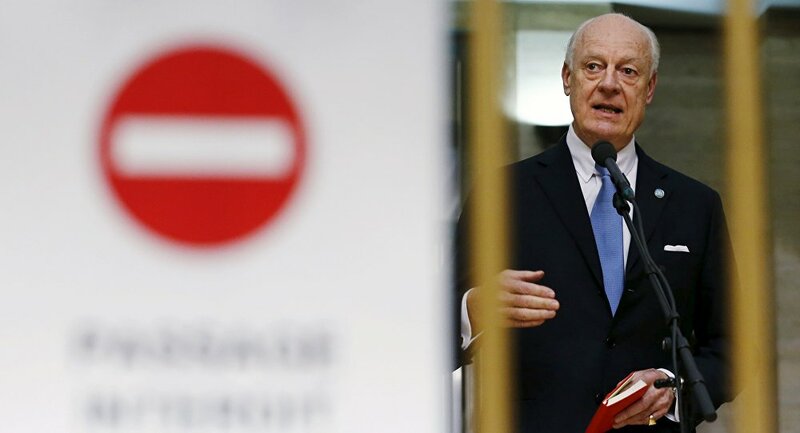 "I am going tomorrow to London to tell them that what they are doing is very important for the resumption of talks and for Syrian people," de Mistura told reporters after a meeting with envoys from Syria opposition's High Negotiations Committee.